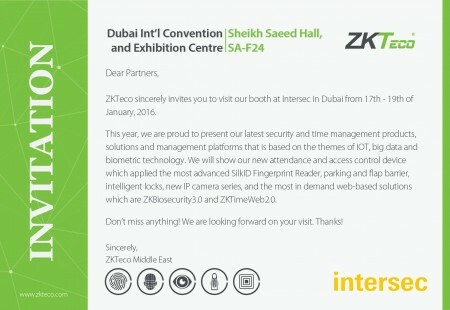 ZKTeco sincerely invites you to visit our booth at Intersec in Dubai from 17th - 19th of January, 2016. This year, we are proud to present our latest security and time management products, solutions, and management platforms, that is based on the thems of IOT, big data and biometric technology. We will show our new attendance and access control device which applied the most advanced SilkID Fingerprint Reader, parking and flap barrier, intelligent locks, new IP camera series, and the most in demand web-based solutions which are ZKBiosecurity3.0 and ZKTimeWeb2.0. Don't miss anything! We are looking forward on your visit. Thanks!